Prepare for a mind-blowing tribute to the legendary Led Zeppelin, one of the most successful and influential rock groups in history! 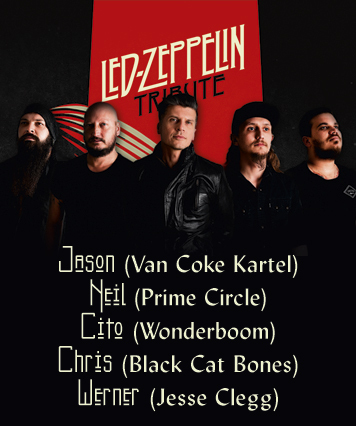 Prepare for a mind-blowing tribute to the legendary Led Zeppelin by Jason Oosthuizen who has hand-picked each artist for the ultimate tribute to the iconic Rock Group, one of the most successful and influential rock groups in history! Experience 2 hours of your favourite Led Zeppelin songs. Featuring the incredibly talented: Jason Oosthuizen (Van Coke Kartel/Lost&Found), Neil Breytenbach (Prime Circle), Martin Cito Otto (Wonderboom), Chris van der Walt (Black Cat Bones/Borgazim) and Werner Bosman (Jesse Clegg).